New players who register at Butlers Bingo will get £10 free bingo no deposit required bonus to have a trial of the site! There are three main bingo rooms and lots of other games including scratchcards and casino games. Once you’ve played through your free bonus you will probably want to make a deposit so that you can carry on playing at Butlers Bingo and when you do, you’ll be in for a treat. The Butler loves to give BBz away and offers 150% first deposit bonus on your deposits up to £100 so if you spend £10 you’ll get an extra £15, if you spend £100 you’ll get another £150! In fact every time you fund your Butlers Bingo account you will receive a bonus of 25% giving you a little thank you every time you make a deposit. This means your deposits of £10 will be topped up with an extra £2.50 and your deposits of £100 will be given an extra £25. When you think that a typical bingo ticket costs between 5p and 10p, that’s a lot of extra bingo games you’re getting. 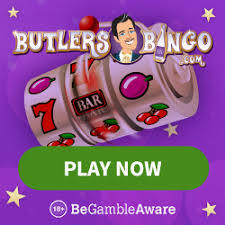 I personally think the Butlers Bingo site is fantastic and has lots to offer in the way of games and brilliant promos. If you don’t believe me why not visit Butlers today and sign up for your free £15 no deposit bonus, you can always walk away if you don’t enjoy the Butlers Bingo experience but I bet you don’t!